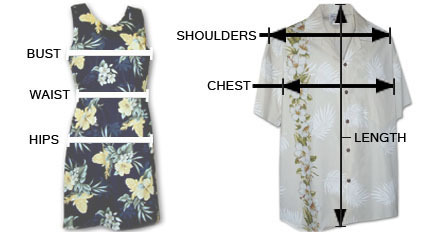 Measure a dress or a shirt that fit you good. Our size chart measurements are from the clothes and not from a person and are measured on a flat surface from inseam to inseam. This is a general guideline to help you select the size you need. Click the size chart you want to see to open and click again to close. Measurements are in inches. If you need assistance or have additional questions, please contact us at 808-545-3179. We are available weekdays from 9am - 3pm Hawaiian Time. Aloha! Inseams and lengths will vary slightly from style to manufacturer. CHEST 24" 26" 29" 31" 33" 35" 38"
LENGTH 16" 18" 20" 22" 23" 24" 25"
WIDTH 16" 17" 18" 19"
LENGTH 20.5" 22" 23.5" 25"
SHIRT CHEST 24" 26" 29" 31" 33"
SHIRT LENGTH 14" 16" 17" 19" 20"
SHORTS WIDTH 15" 17" 19" 20" 21"
SHORTS LENGTH 10" 11" 11" 12" 13"